The December 24, 1900 Boston Globe included an article that imagined what Boston would look like in the year 2000. Written by Thomas F. Anderson, the article was titled "Boston at the End of the 20th Century." Anderson envisioned a city with moving sidewalks, pneumatic tube delivery of everything from food to newspapers, and airships soaring high above the city. Overall, Anderson's predictions are quite optimistic. He predicted that Boston at the turn of the 21st century would be so beautiful that the word "slum" wouldn't even be found in the local dictionary. With all the fantastically futuristic predictions made in the article, it's somewhat interesting that the most quaint idea in the entire piece is the idea that Boston of the future will have both a morning and evening edition of the local newspaper. This newspaper of the future was, of course, to be delivered by fancy pneumatic tubes, but you'd be hard pressed to find a young person in the year 2000 who even knew such a thing as an evening edition of the newspaper ever existed. From radio to television to Internet, it's fascinating to look at the rapid and revolutionary changes in the way Americans consumed news over the course of the 20th century. 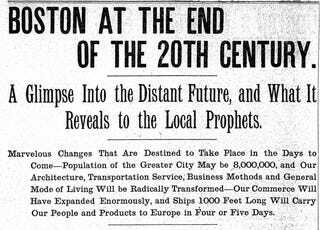 This article is an artifact that, like most predictions from the past, gives us some wonderful insight into the hopes and fears of Bostonians at the turn of the 20th century. Some highlights from the article appear below. In that golden age for Boston, when the population of the United States will be somewhere between 350,000,000 and 500,000,000, when the tides in the harbor will be made for furnish[ing] heat light and power, when every person will own his own automobile, or whatever it may be called in that day; when people have learned how to live longer and suffer less from sickness; when sewage and garbage nuisances will no more exist; when [the] new Franklin Institute will long have entered upon its career of usefulness, and when the great world's fair in Boston shall have become a pleasant memory of the past, it is not too much of a task on the imagination to believe that women will have taken a much more important position in the business and political life than they hold today. The three problems that bear the most important relation to the city's future growth are those which concern the increase in its population, the development of its commerce and the improvement of its transportation facilities. There's no mention of the Big Dig anywhere in the article, but Anderson envisioned a world where everyone in Boston had cars, airships sailed over the city and moving sidewalks made walking so much easier. It might be easy to dismiss the transportation problem by saying that a century hence we will be moving over the housesteps of Boston, a la Santa Claus, in airships, but even airships would not solve the transit question in a city like Boston, however practicable they may have become at that date. "As far as Boston is concerned, there is certain to be a great change in transportation conditions. In the first place, it is conceivable that all the railroads of New England may be under one management 100 years from now, perhaps [under] control of the government, although I don't believe that this will be a good thing. "We shall probably have one great terminal for all the railroads entering the city, and what the railroads call the 'suburban zone,' at present extending about 12 miles out of the city, may then extend for 25 or 30 miles out, perhaps farther." There seems to be no reason to believe that the Bostonian of the future will take any less interest in athletic sports and pastimes than his predecessor of the 19th century. Indeed, with the greater proportion of leisure he is likely to enjoy in that day, his interest in these matters should increase. Most of the baseball cranks of today are confident that the national game will continue to hold its prestige through the coming century, and that it is likely to be played at night as well as by day, inasmuch as the illuminating methods of the future are reasonably certain to practically banish darkness from our cities. Other forms of outdoor sports will doubtless be invented, but baseball, the "rooter" maintain, will never lose its hold upon the affections of the people. Boston's population in 1900 was just 560,892. Though Anderson's article predicted a population of more than 5 million in Boston by the year 2000, the actual population of Boston proper in the year 2000 was 3.4 million 589,141. They predicted that Greater Boston (Boston and its surrounding suburbs) would have a population of 8 million by the year 2000, but the area had just 4.4 million people by the 2000 census. In the first place, when the year 2000 dawns there will be no more unoccupied land in Boston, save that reserved for public parks and playground. The only "vacant lots" that will occur at that period will be those created by the tearing down of old buildings to make space for new ones. "Altogether, there is every reason to believe that the principle of universal education, as opposed to what may be called artistocratic education, is to receive a more and more general application; and among other things, it is going to discover and bring forth from the lower ranks of our people not only talent, but genius. Already there are encouraging indications of a much needed awakening of public sentiment in regard to the urgent need of rescuing our schools from their present unfortunate environment, and I cannot feel that the future is destined to bring us better things in school administration, along with the higher intellectual development of our whole community." During the Irish potato famine of the 1840s over a million Irish immigrants came through Deer Island. In the year 1900, Deer Island in Boston Harbor was used for processing immigrants and Anderson's article predicted that a large receiving station would be built there by the year 2000. The long talked of public docks on the unfilled East Boston water front will long have been in use, and other will stretch far beyond them to Deer Island, where probably will be established a great receiving station for both immigrants and merchandise. The man or woman who views from the state house dome the great city of Boston in that day will see many fine public buildings that do not exist now, including a new city hall and public libraries, and scores of attractive schoolhouses in which the scholars will neither grow blind as a result of insufficient light nor contract disease as from the effects of bad drainage. The article has some similarities to an article by John Elfreth Watkins, Jr. that appeared in the December, 1900 issue of Ladies' Home Journal. Through the work of men like Lee De Forest and Guglielmo Marconi, wireless telegraphy was showing such promise at the turn of the 20th century that wireless telephone communication was seen as almost a certainty in the 20th century. The telephone will have become a relic of the past, and by means of wireless telegraphy the citizen may communicate with any city or town in the land. Though most Americans of the year 2011 only interact with pneumatic tubes at the bank drive-thru window, the year 1900 had high hopes for this wonder technology as a means of transporting goods. Edward Bellamy's futuristic Boston in the 1888 book Looking Backward also featured a series of tubes that were used for deliveries. The pneumatic tube service, by the way, will have reached its perfection long before the first half of the new century has flown. It will have become a most important factor in the domestic life of the people which also will have undergone great changes. Through such tubes a householder will undoubtedly receive his letters, his readymade lunches, his laundry, his morning and evening paper, and even the things he may require from the department store, which will furnish at the touch of a button any essential solid or liquid that can be named. By means of his electro-pneumatic switchboard, with which all well regulated houses will be equipped, he may sit in his comfortable arm chair and enjoy either the minister's sermon or the latest opera in the new Symphony hall of the vintage of 1960. "The system of pneumatic transmission of mail already introduced is undoubtedly to have an extensive development, and I have little doubt that the time will come when mail will be sent from the central or branch post office through such tubes directly to the house or office of the citizen who cares to pay for the cost of such service. "It may be only a matter of months before the central office in Boston is connected with the various branches by pneumatic tube service, as I have already asked the department at Washington for permission to connect the Back Bay and South end stations with such a service. There is little question that the efficiency of the postal service will be thereby materially increased. I do not anticipate that the cheapening and extension of the telegraph or telephone service is going to adversely affect the number of letters written and mailed in the future. On the contrary, the cheapening and improvement of the postal service may operate as a factor against the growth of the other service." Not only will hot and cold water (the one furnished by a heating company and the other sterilized before being sent through the pipes) be constantly at his command, but hot and cold air and even liquid air will be possible to turn on an imitation east wind at any time the outside temperature reaches an uncomfortable height. The article imagines a Boston complete devoid of smoke and steam rising from its buildings. "New methods of generating heat and power" will have rendered such primitive exhaust, the pungent breath of major cities in the year 1900, completely obsolete. The city is also imagined as incredibly quiet, the noise and confusion having gone the way of the horse and buggy. Anderson spoke with Dr. Samuel H. Durgin, chairman of the Boston Board of Health, about the future of health care in Boston. Not surprisingly, Dr. Durgin believes that cleanliness will bring about much improved health for the citizens of the year 2000. "From a health standpoint the needs of Boston are many, and in some cases urgent. We need, among other things, more hospital accommodations, especially for consumptive and contagious cases, and the building of these must be considered in the year future. "The difference between clean and dirty streets constitutes an important element in the health of a city, and the presence or the absence of the smoke nuisance bears directly upon the comfort of the community. It is reasonable to believe that we shall get rid of both our smoky chimney and our dirty streets during the coming century." What is to be Boston's status as a financial center at the close of the year 2000? Mr. A. P. Weeks of the Merchants national bank, whose opinions on banking matters are always highly regarded by his associates, said in reply to this query: "Unquestionably great changes are to take place in banking methods in the coming century, and yet the underlying principle of the utilization of credit rather than of actual money will continue to be a fixed one in business matters. "It is all a matter of guesswork, of course, but it is quite conceivable that the present tendency to consolidation in Boston may continue until there shall be in the years to come but one large bank in this city, with branches at convenient points throughout the community. "As compared with New York, it is likely that Boston as a financial center will lose a little rather than gain prestige, but it will always be a very important city in this respect, from the fact of its commercial and industrial rank." Most cities in the U.S. love to lay claim to the saying, "We have an old saying in [city X], if you don't like the weather, just wait 10 minutes..." This article closed on its own light-hearted weather joke, seemingly poking a little fun at its local forecast official and the difficulty of predicting the weather. There is one thing which The Globe, in its 20th century canvass, has been obliged to "slip up on," and that is the subject of Boston weather in the coming period of progress. Our genial and cultured local forecast official, Sergt J. W. Smith, who is alway a copious fountain of information concerning the weather of the past 25 years and the "probabilities" for the next 24 hours, has been obliged to throw up his hand on the question of what climatic conditions in Greater Boston are likely to be in the year 2000. He really did make a serious effort to help The Globe out in this important matter, but after spending a whole week immersed in a mass of therometric and barometric computations, celestial charts, hydrographic reports and humorous weather stories from the back files of the Boston papers, Sergt Smith was obliged to give it up as a bad job and go off for a two-days' vacation. He is inclined to think, however, that the year 2000 may still bring forth an occasional Boston day in which rain sunshine, snow, hot waves, cold snaps, thunder and lightning, hail, fog, east winds, west winds and south winds will each play their particular part in the weather drama of the 24 hours, and that in this respect at least Boston will remain the same dear old Boston.